"Nishigawa Green Park", filled with the colors of green and blue, is located beside the river which crosses south to north in central Okayama city. Here, people have many choices of cafes, bars, and restaurants. In the past, this place had been considered as a site for a parking lot. You hardly could see the bottom of the Nishigawa river. The residents did their best to clean this area up, and make the river more beautiful. Also, in the last 10 years, there was not many visitors to this area. Few people were seen walking along the river at night. The power public space can have is transform how people experience their city, and this is the reason why we Tabula Rasa have started taking an action with Nishigawa. First, we held an art exhibition and ran an open-air cafe at Nishigawa, but we were surprised and shocked at how much packing waste we had after just one day. Then, we switched from paper cups to reusable cups at our events. There was a drastic change in waste, and it made our activities more clean. Simple choices like this can make a large impact on our environment. From this, we started one of our projects called "EC[H]O-SMA". 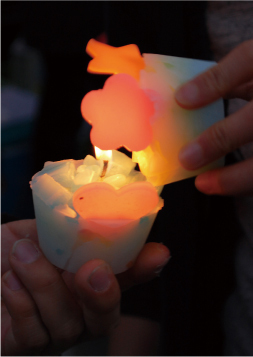 Next, we began another project called "Nishigawa Candle Night". Both of these projects are coming along well with the place. Nishigawa has given us clear objectives. We are focused and committed to think about the community where we live. 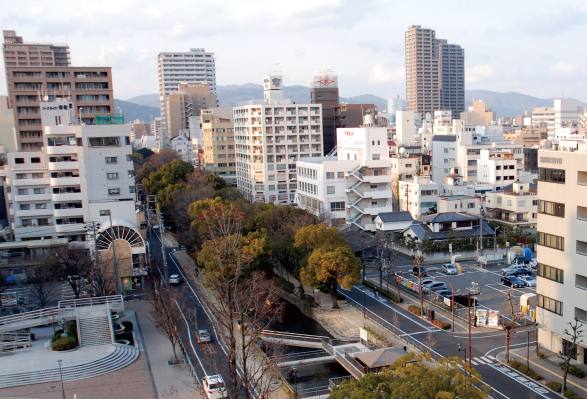 Currently, we are working on five different projects around Okayama. The work that we have done is to make a chance of an encounter which sparks a new idea. It seems to light candles. We connect one to the other and to the other like a candle relay. Each problem that we face and solve will lead to another issue that needs a resolution. We truly believe that we can make our wonderful city even better. Little by little, step by step, we will reach our goal of "1mm level up of Okayama". All of us are "connecting the dots" and "tying a knot". "Connecting the dots" refers to finding ways to improve our city. "Tying a knot" refers to making our city as strong and stable as it can be. "The knot" is what we are devoted to becoming. Copyright (c) 2015 Non-Profit Organization Tabula Rasa All Rights Reserved.